Looking for an allergy relief? 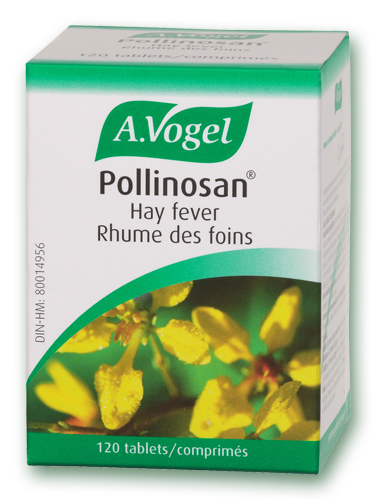 For the treatment of sneezing, itchy nose, burning eyes, consider A.Vogel Pollinosan. Believe it Homeopathethic A.Vogel Pollinosan tabs work! They have been used for over 60 years with research to back it up that it works! This formula is also sugar and gluten free! Pollinosan not only lowers the allergic reaction but also relieves symptoms. One of the other actions of Pollinosan is to remove the toxins associated with the allergy mechanism, such as histamine and other chemical mediators. The allergy mechanism is a complex one involving the immune system. In simple terms, an allergy occurs when the body is exposed to an allergen (foreign substance that causes a sensitivity). Exposure to an allergen induces cells of the immune system (B-lymphocytes) to produce IgE (immunoglobulin E). IgE then binds to mast cells which stimulate the enzyme that pumps calcium into cells. The change in the intracellular calcium in turn causes the production of histamine and other chemical mediators known as leukotrienes. It is the release of these chemicals into the bloodstream that causes allergy symptoms; sneezing, itching, cramps, diarrhea, bronchoconstriction, edema and anaphylactic shock. No matter which kind of allergy you have: to food, pollen, dust, mold, animals, etc, the allergy mechanism is the same. The above explanation is only a simple rendition of the intricate biochemical nature of the allergy mechanism. It is within these biochemical reactions that we can mediate the allergy mechanism with remedies or drugs. Homeopathy does not work like drugs or tinctures. Homeopathic remedies do not require a certain blood level to work. It is not a good idea to double dose homeopathic remedies … in some cases you may actually be inducing the wrong or opposite effect when you increase the dose. For an acute reaction (severe reaction) increase the frequency of the dose. You can take the recommended dose every half hour until the symptoms subside. Then, return to the normal recommended frequency. Curamin by Terry Naturally: Fast Pain Relief! ASK Alice Chung Featuring Bryce Wylde – MyStatus Testing Kits: Canada’s Natural Health Leaders!